What is it about the worst of human nature that so many people find fascinating? Is it a quest to understand the depravity that roils around in the mind of a psychopath? Or perhaps it’s just a glimpse into the darkest parts of ourselves that makes weird or brutal true crimes so fascinating? Either way, whenever a strange crime or terrible act is committed, there’s some small part of us that can’t help but look at the terror. Why people are so fascinated with the true crime genre? Because it puts the audience at the center of the story with access to information that may unlock an unsolved mystery! 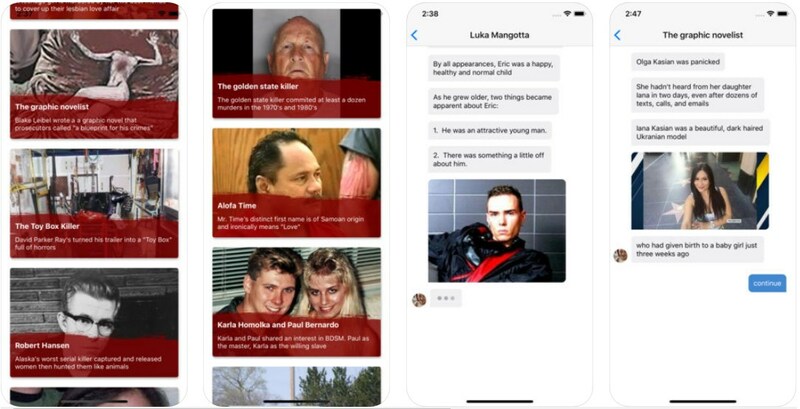 So, if you’re into reading true crime stories, read our article about an app that brings them directly to our smartphones. We’re talking about a unique app called Murder Minute. Developed on both Android and iOS platforms, this app brings tons of true crime stories right at your fingertips, every day. You can read them anywhere and anytime, and have it completely free of charge. Remember: you will get hooked! Let’s see what the app’s best features are. We may not be able to comprehend why exactly people do these things, but that doesn’t change the fact that there’s something undeniably alluring about reading stories about them. Murder Minute is here to provide daily true crime stories, it is a place where you can read a wide variety of true crime stories, some of which you will find nowhere else. With a new episode being released every day, this app is the newest hit in our office. Murder Minute actually brings you suspenseful true crime stories that are presented in a unique chat format. Users have the chance to read about famous serial killers, known and unknown murder cases, mysteries, high profile police investigations, dramatic man hunts, and so much more. Enjoy the mysteries of solved or unsolved murder cases, explore the minds of psychopaths and murderers, and entertain yourself by reading these real stories every day. You can download Murder Minute for free from Google Play or from the App Store.